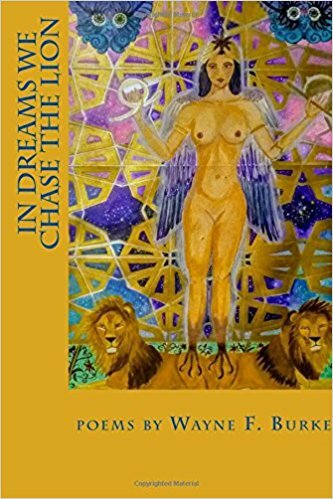 BOLD MONKEY: New Release: Wayne F. Burke IN DREAMS WE CHASE THE LION. Alien Buddha Press, 2018 (92 pages). New Release: Wayne F. Burke IN DREAMS WE CHASE THE LION. Alien Buddha Press, 2018 (92 pages). 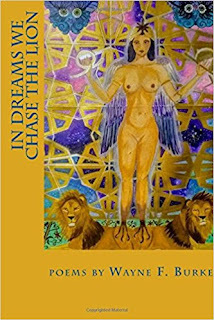 In Dreams We Chase the Lion is Vermont writer Wayne F. Burke’s latest book of poetry. It includes sixty free verse poems written from a variety of voices and styles. The book is divided into ten parts. The early sections adopt different voices or thematic concerns, whereas the latter sections revert back, for the most part, to what Burke is best known for- his first person, anecdotal narrative poems. The book is a kind of experiment in different voices, at least in the first 3 sections. The "I" not "I"--not wholly anyway--yea I did write it but as imaginative leap into guise of a narrative-other, the hard cartoonish guy (Ramrod), a soldier (Vietnam), a kind of American everyman... Correlates to writing fiction but using poetic form, lines and rhythm. Sections 4-10 revert back to a voice closer to a narrative "I" identifiable as me (whomever that may be), particularly in late poems of autobiographical nature. I agree that the middle sections are a hodgepodge of poems, although there is a connecting theme to each section, theme or form or voice. Maybe not obvious, but I did group poems I thought fit or complimented each other. The cover features a naked woman with clawed feet towering above two contented male lions. The art is by Ammi Romero and has a strong mystical feel to it favoured by the 2016 start-up Alien Buddha Press and go-to editor Red Focks.